MONTREAL — Communities across much of Eastern Canada are bracing for more flooding today, with rain in the forecast from central Ontario to northern New Brunswick. Officials in Quebec are keeping a close eye on a hydroelectric dam west that’s at risk of failing, while Ottawa’s mayor has declared an emergency and part of the Trans-Canada Highway has been closed in New Brunswick. 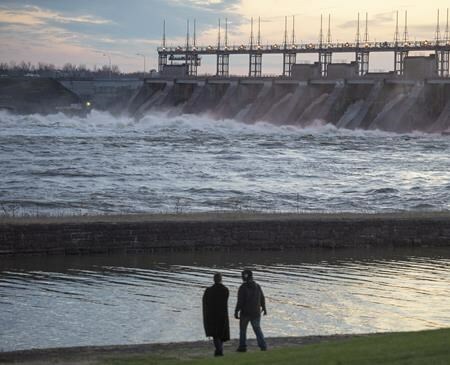 The Chute-Bell dam west of Montreal has reached “millennial” water levels, meaning a flood that happens once every 1,000 years, but Hydro-Quebec says it’s confident the structure is solid. Meantime, Ottawa has joined several smaller Ontario communities in declaring a state of emergency, with Mayor Jim Watson requesting help from the Canadian Forces. Farther east, New Brunswick’s Department of Transportation said the Trans-Canada Highway was fully closed from Oromocto to River Glade, and could remain closed for several days. And there’s not much relief in sight, with Environment Canada predicting rain for a large swath of Eastern Canada, from Georgian Bay to the Gaspe Peninsula. The head of the lobby group representing chief executives of Canada’s largest corporations said he’s already raised the issue with political leaders who are shifting into campaign mode for the October vote. 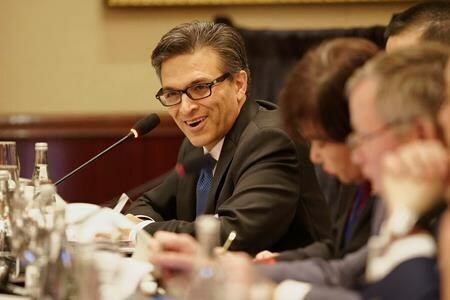 With signs of public concern about immigration, Business Council of Canada president and CEO Goldy Hyder said he’s promoted the economic case in favour of opening the country’s doors to more people. The message from corporate Canada comes at a time when public and political debate has focused on immigration, refugees and border security, to the point it could emerge as a key election issue, tempting parties fighting hard for votes. A poll released this month by Ekos Research Associates suggested that the share of people who think there are too many visible minorities in Canada is up “significantly,” even though overall opposition to immigration has been largely unchanged in recent years and remains lower than it was in the 1990s. Canada has been ratcheting up its immigration numbers and it plans to welcome more. The Immigration Department set targets of bringing in nearly 331,000 newcomers this year, 341,000 in 2020 and 350,000 in 2021, according to its 2018 report to Parliament. As the baby-boomer generation ages, experts say Canada — like other western countries — will need a steady influx of workers to fill jobs and to fund social programs, like public health care, through taxes. Thanks to the stronger economy, Canadian companies have already been dealing with labour shortages. Healthy employment growth has tightened job markets, making it more difficult for firms to find workers. “Every job that sits empty is a person not paying taxes … We have job shortages across the country and they’re just not at the high end,” said Hyder, who added his members are well aware that immigration has become a tricky political issue. Hyder also brought up Quebec Premier Francois Legault’s election promise last year to cut annual immigration levels in his province by 20 per cent. Legault won the election after making the vow, even though Quebec faces significant demographic challenges. Earlier this week, the Bank of Canada noted the economic importance of immigration in its monetary policy report. Carolyn Wilkins, the central bank’s senior deputy governor, said without immigration, Canada’s labour force would cease adding workers within five years. Hyder said he’s personally part of a group called the Century Initiative, which would like to see Canada, a country of about 37 million, grow to 100 million people by 2100. The group was co-founded by Hyder and several others, including two members of the Trudeau government’s influential economic advisory council — Dominic Barton, global managing director of consulting firm McKinsey & Co., and Mark Wiseman, a senior managing director for investment management giant BlackRock Inc. Hyder was a business consultant before joining the business council and was once a top aide to federal Progressive Conservative leader Joe Clark. The Century Initiative wants Canada to responsibly expand its population as a way to help drive its economic potential.